While gold might traditionally be thought of as jewelry or coins, it is actually a viable retirement savings vehicle! You can invest gold into an IRA and can even convert your employer-sponsored 401(k) into a Gold IRA. Let’s look at some of the basics of investing for retirement, including the differences between a 401(k) and an IRA, why gold is seen as a solid investment, and how you can transfer your retirement savings into a Gold IRA. What are the differences between an IRA and a 401(k)? A 401(k) is often provided by an individual’s employer, and companies provide the option to invest in a 401(k) through direct withdrawals from a participant’s paycheck. These deductions can vary in amount and are sometimes matched by an employer. A 401(k) contribution is factored on a pre-tax basis, meaning the money you use to fund the account is not taxed upfront. Disbursements will be taxed when they are withdrawn from the account. An IRA, or Individual Retirement Account, is set up by a private investment company, like American Bullion, and is separate from an individual’s employer. There are SEP, Traditional, and Roth IRAs that all have different tax considerations. 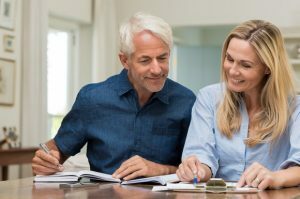 Here, you can find our Complete IRA Information Guide that explains the difference between these, and other, IRA options. Gold limits exposure from Wall Street – Gold doesn’t depend on credit to function and having physical ownership of an asset may lower overall portfolio risk through diversification. Gold creates protection for your portfolio – Gold has been a source of wealth for thousands of years and has outlasted many of the world’s currencies. It is tangible, fully-insured, and stored in IRS-approved depositories. The dollar doesn’t buy what it used to – While the US dollar has depreciated, gold has steadily increased in value by over 300% since 2000. Now that you know some of the reasons why more and more investors are turning to gold, let’s look at how this precious metal can help you retire! So how do these coins play a role in your retirement savings? Enter the Gold IRA. A Gold IRA (or Precious Metals IRA) is a self-directed Individual Retirement Account that has become incredibly popular in recent years, particularly among those who value diversity and stability in their investment portfolio. A Gold IRA gives investors the ability to add physical precious metals, in the form of coins and bars, to their tax-sheltered retirement accounts. Precious metals, which have long been considered a classic hedge against inflation and geopolitical crisis, are ideally suited to create diversification away from paper assets for the long term investor. If you have a 401(k), you can still use gold as a retirement investment! You would simply just rollover your 401(k) into a Gold IRA and buy your gold investments. Still have questions? Contact American Bullion today!